And yes, they’re ridiculously cheap, cheap out of sync with the massive flavour punch they deliver. 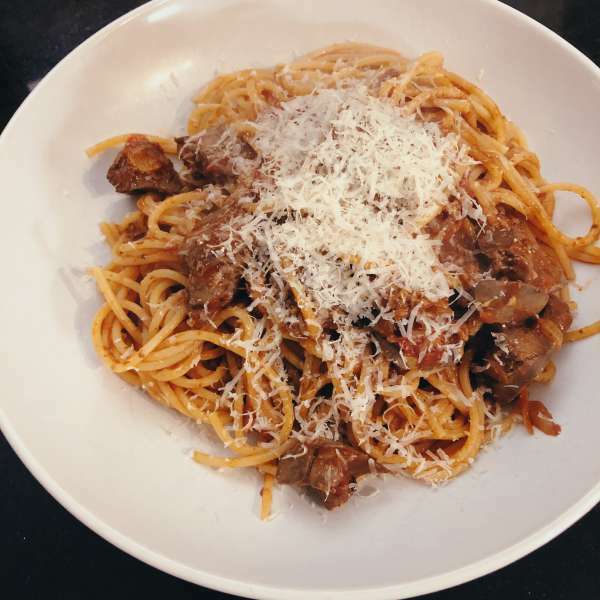 This recipe for a very quick, simple and easy ragu plays on the basic earthiness of the humble chicken liver. It takes about fifteen minutes to cook from start to finish and weighs in at a good chunk less than £1 a head. Start with a standard 400g supermarket pack of chicken livers, and trim out the fat and sinew with a pair of scissors or a small knife. Drop the trimmed livers into a sieve and rinse them under the cold tap to get rid of any gunk or blood, then transfer them to a bowl and soak them in some milk. This seems like a bit of an urban myth, but the milk really does help to improve the flavour, and it makes the livers silky and tender. While the livers are in the milk, slice up an onion and four cloves of garlic, and fry them in a little olive oil until starting to turn golden, then drain the livers and add them to the pan, tossing them around to cook evenly. Liver cooks quickly, so be sure not to over-fry. Be careful, also to cook them through properly. Chicken blood is not something you want to be eating raw. Season with salt and pepper, and add a teaspoon of dried mixed herbs, and then a can of chopped tomatoes. Stir gently and let the sauce bubble away while you cook some spaghetti. When the spaghetti is cooked, fish it out of the water and transfer it straight to the the pan with the sauce, turning and moving it around to coat it evenly. If the sauce seems too thick, add a splash of the spaghetti cooking water. Finish with a handful of chopped parsley and some grated parmesan and serve immediately. This recipe is adapted from the brilliant Cooking on a Bootstrap by Jack Monroe, which is worth a few pounds of anybody’s money, and will most likely save you many more.